When you wrote “Best laid plans and all that. The Miquelrius journal has been a disappointment. The paper bleeds worse than the paper in my copier so I’m looking for something better.” I thought ‘What the hell I just bought one on your recommendation.’ It came in the mail this afternoon. Using two different inks and two different nib sizes I found it to be quite satisfactory and with no bleeding. As your original article said it is ‘fountain pen friendly’. So now I’m questioning your ability to review and your truthfulness / accuracy in reporting the results. The paper can vary from year to year and product to product. I did not lie about my experience with Miquelrius. The front of a page is smooth with fountain pen nibs, but on the reverse side, the bleed through with three of the four inks tested was significant. Those tests were conducted as I began using the journal after January 1. My previous experience with the brand was satisfactory, so there was no reason to suspect the current lot of journals. Question my integrity all you like, but note that this will be your last comment on my blog. Can I kick *rgstl* in the shins? Please? This is a non-violent blog, but do what you’ve got to do. In seven years of writing this blog, there have been only a few people who have used personal attacks whether towards me or someone else. Banning is my solution. Any future comments go straight to the spam folder. I figure trash is trash. No need to play in it. I would try one of the Leuchtturm1917 notebooks, I am on about my 4th andd they are great with FP ink and very consistent. Dots & lines and various sizes / colours are available. Thanks for the suggestion. I might have one on the way for testing purposes. Do you know if the grid lines are dark or pale? Never mind the paper quality of the Miquelrius… I’m much more incensed by you claiming that the Lamy Vista is “so inconsistent” – HERESY!! Lol. How DARE you have an opinion on something based on personal experiences!! ~ end sarcasm! I do have to wonder about some people, sometimes! I’ve never tried a Miquelrius myself, so can’t comment. However, it’s good to know that you experienced this particular aspect of the paper, should I consider buying one in future. We all know that when it comes to pep+ink+paper+environmental conditions+user, there are enough variables for us all to have our own issues/experiences. Reviews are only ever a personal record, to be used as a guide. It’s not like you’re employed to give 100% factually accurate information by the manufacturer, in order to sway purchasers. I don’t comment very often on here, but I’ve been reading the blog for years now and I don’t think I’ve ever seen your honesty or integrity questioned before now. It was quite bizarre! I love your blog – even if I am a wee bit envious of all the products you’ve reviewed! I can only dream of possessing all the pens, inks and paper-based paraphernalia you’ve had access to! The two 1.1mm Vistas in my pen drawer are smooth writers, but are flow challenged. So more accurately, it’s the nib – not the pen. I don’t like to tinker with pens and prefer to use them as most readers would – out of the box and down to work. There are at least another six Lamy Safari and AL-Star pens here with a variety of stock nibs and even a few modified ones. The EFs are all great. The B is super smooth. The best though is one that was reground and makes every ink shade. It is perfect with Montblanc Racing Green. Now that’s a match made in heaven. As for those who would use personal attacks, there have been few and probably no more than one or two per year. In 2014 Inkophile had just over a quarter of a million page views, so that’s a very small percentage indeed. Due to spammers, all comments get reviewed before you see them and ad hominem attacks do not get approved. Sometimes points made by a commenter are worth addressing so I let those through. People get their knickers in a twist over all sorts of things. Running this blog has been educational and not just about pen and ink. Yes, there have been many excellent products sent for review. I would never have been able to purchase the Platinum pens or variety of Noodler’s products sent by Luxury Brands or tested all of the sketchbooks offered by Stillman & Birn if left to my very limited new acquisitions budget. Jet Pens has sent lots of items and Paper For Fountain Pens sent paper that is lovely to use. 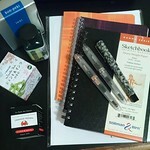 Exaclair has been very generous with J. Herbin, Clairefontaine and Rhodia products for many years. There are others so that is not a comprehensive list. Inkophile would have folded long ago without the support of retailers, manufacturers and distributors. In addition, readers have sent products that can be reviewed and that is always special. Rob, the guy who posted the attack comment, could have written about how his experience with Miquelrius differed from mine and that would have contributed to the dialogue. Instead, he decided to be nasty about it. I reckon he needed to vent. He just did it in the wrong direction and earned a lifetime ban. Sometimes it’s good to be the boss! I have yet to try an EF Lamy nib yet. I really ought to go and pick one up from Bureau Direct, because I’d like to pair it with some Bulletproof Black, to give a fine, yet strong definite line. Perfect for filling in forms etc. Let me know what you think of the EF. 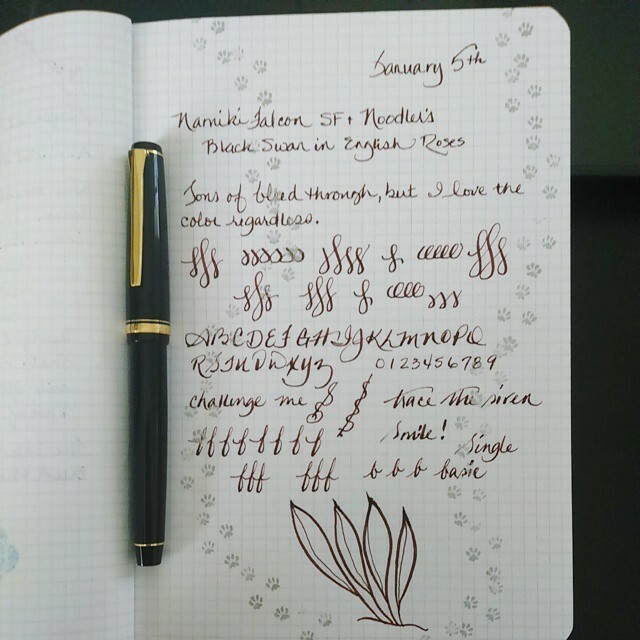 Mine is often paired with Noodler’s Black as it is today. 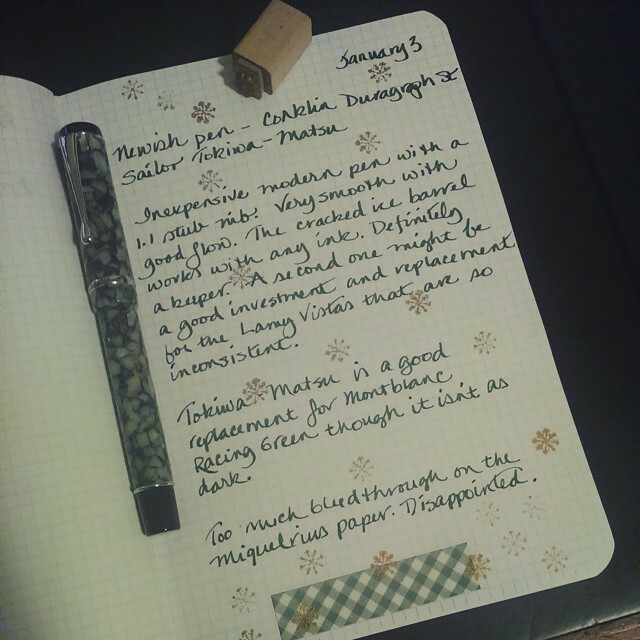 It’s a duo that works well on cheap paper and is even a good writer on Moleskine. Enjoy yours!